Imagine you and your spouse traveling to different state parks every chance you get. You might even decide to invite two to three overnight guests on occasion. Whether you enjoy fishing on the lake, hiking in the woods, or backpacking in the mountains, this Connect will allow you to store all of your outdoor gear in the exterior pass-through storage as well as on the rear storage rack. Inside you will find more places to put your indoor camping items such as the dual wardrobes in the bedroom, the kitchen overhead cabinets, and the linen cabinet in the rear full bathroom. The walk-in pantry will provide extra space to hold onto the ingredients that will make a warm and hearty dinner each night. 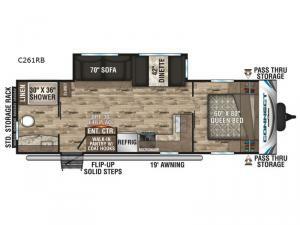 The single slide in the living area adds some extra floor space, comfortable furniture, and sleeping accommodations. Check it out, there is more to see!